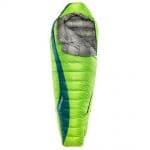 Designed by the trusted sleeping pad kings at Therm-a-Rest, the Questar 20°F sleeping bag is designed for moderately cold climbing trips such as Mount Baker in the summer, or for trips where insulated shelters are provided like on Mount Elbrus. It features zoned insulation to maximize thermal efficiency and minimize weight, Nikwax Hydrophobic Down for nearly waterproof performance, and Therm-a-Rest's proprietary SynergyLink Connectors. The SynergyLink system can quickly be fixed to your sleeping pad, ensuring that you no longer slide or roll off of your pad at night. For traditionalists or those looking to save further ounces, this feature is modular, and can be removed within seconds. This bag is rated to an EN limit of 20°F / -6°C, and is generally suitable for peaks like Mount Baker, Mount Shuksan, or Mount Elbrus. It can also work well on the 6-Day or 13-Day Mountaineering Course. Please consult your gear list or get in touch to talk through the best bag for your objective. Note that Alpine Ascents strongly recommends an aftermarket compression stuff sack, like the Sea to Summit eVent Compression Dry Sack, to reduce the volume of the sleeping bag while packing. **Please call or email us to special-order a short length!